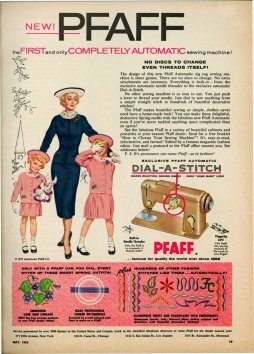 Where does Pfaff come from, you ask? A close watch on industry needs and trends has become increasingly important as sewing has evolved from a necessity to a form of creative expression. And this evolution is something they take very seriously. It has inspired their product development to be driven by insight, not just demand. And as a result, their products embody the innovative technology and best-in-class craftsmanship required by today’s most passionate creators — required by those who wish to stand out in a crowd. They believe the search for individuality will always be in style.